When it comes to scale, there are clear parallels between evolution and business. I was (literally) browsing your blog for the first time yesterday during my nightly “read until my brain shuts down” ritual. 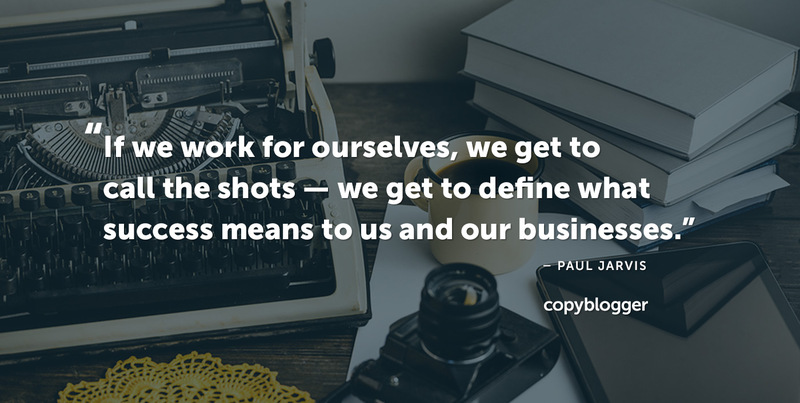 Great to see you here on Copyblogger. Thank you for the great thoughts, and congratulations on the book! This post couldn’t be more timely. I work in the real estate industry and have bucked the “growth” tenets preached to build my brokerage business. Having operated since 2004, I’ve seen a good number of my competitors disappear from the landscape. And they all have one thing in common; they chose growth by size and scale over revenue. Looking forward to picking up your book. I love the idea of staying small if it’s what suits me. So many of these business gurus advocate that solopreneurs should start hiring teams and delegating and so on, until they get to the point where they’re no longer doing the thing they enjoy, and they’re just managing other people. I don’t want that for myself! So this post definitely resonated with me and I’m looking forward to reading the book!